Above the littered nursery floor. How many impossible palaces never stand free of our fingers? A lonely outpost dreads the coming horde. Our monuments are all afternoon ancient, half sunk. above a metropolis some millenia away. Dad, are you a boy or a girl? I said that earlier. I’m just a girl. I just have long hair. I’m making a swing now. That’s a slide. This there. Now fire is going to come out after I chop all the pieces down. Are you going to see it? Now fire is coming out to scare you! This is somebody’s fire. It’s not coming out any more. I’m cutting the lemonade because it’s not fire anymore. I’m cutting the fire. You do that and then you do that. Oh, actually you just need that one. Maybe a angel could come live in it. Uh! I knocked it down! Sorry, Angel. Don’t miss a thing. Follow Huckleberries on Facebook. Anna came to my house and took me to see baby Beau. He is little. I see him sleeping and when he wakes up I give his head gentle touches. 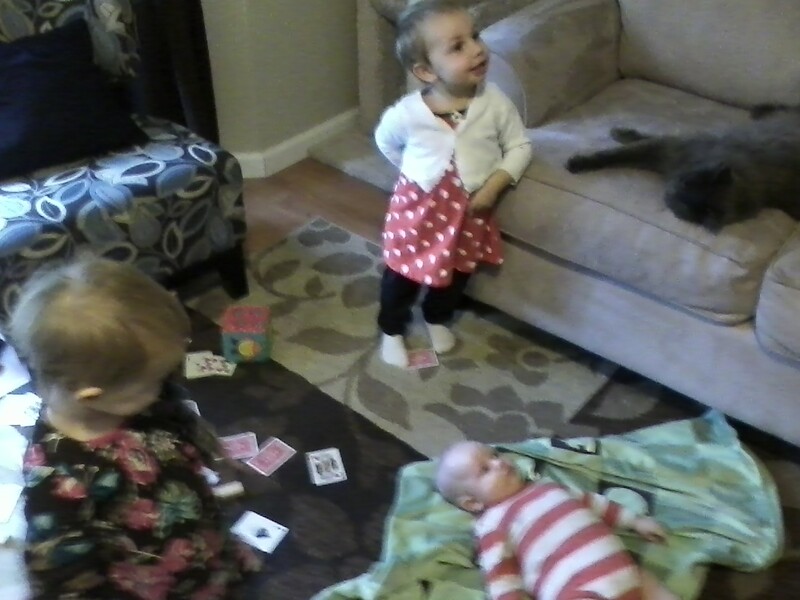 Baby Beau has a pet. Kitty Cat! A long fluffy tail and soft soft fur. I give the cat gentle touches too. Then I push the cat’s nose. Back up! Mama says I don’t have to do that to cat because they are not Phydeaux. Okay. Just checking. I eat all Anna’s oranges and some sandwiches. 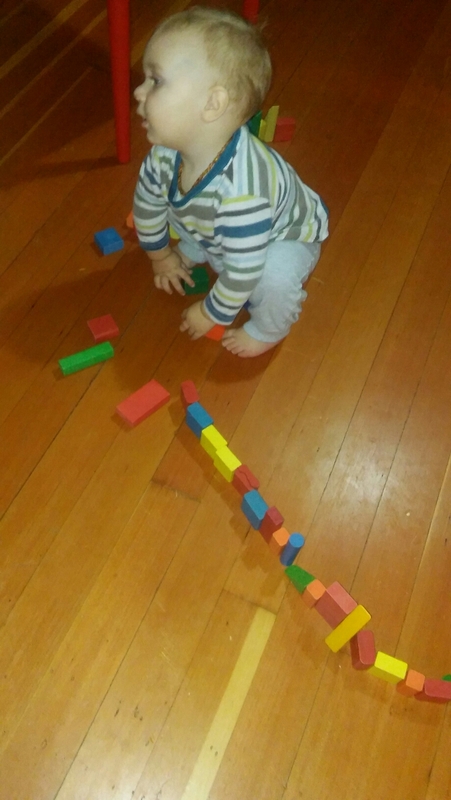 We find Beau’s big cloth blocks. Tower! 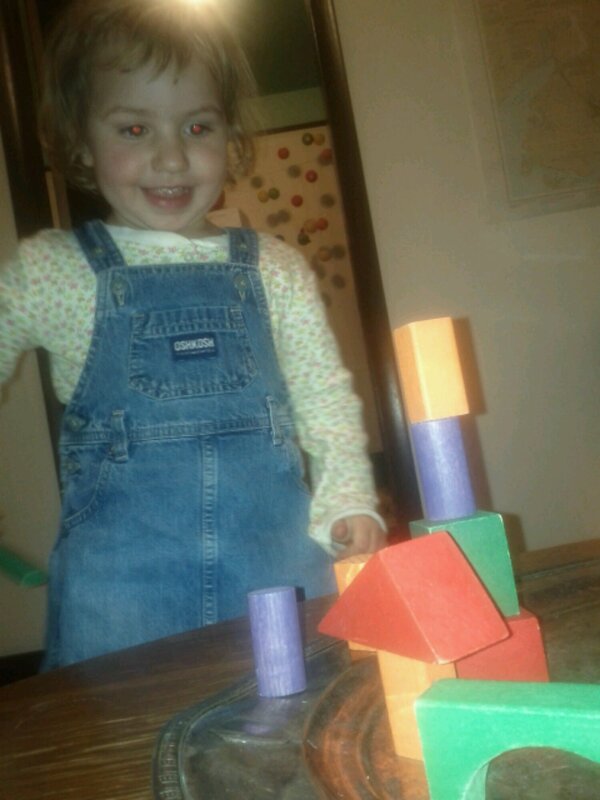 Anna, tower. Right there. One two one one one. Big! Tower; knock! Fall down! Knock! Knock! Tower. Anna and I find baby Beau’s food boxes. We make more towers and scatter them all around. Now it’s time to clean up. Back back box. Anna brings me home and I try to visit Mabel but no one comes out so I put some of her rocks in my mouth. Mimee: home. I go in and tell her about Anna. I eat ‘cados and chips and a little salsa. Monkey snuggle. Mimee? No way. Hello. Water water? Okay. Cough bless you. O de baby la yay! Cute baby. Sit down. My favorite toy store is Goodwill because that is where my Mama actually buys some. Remember my awesome ferry boats and cars? And my train? 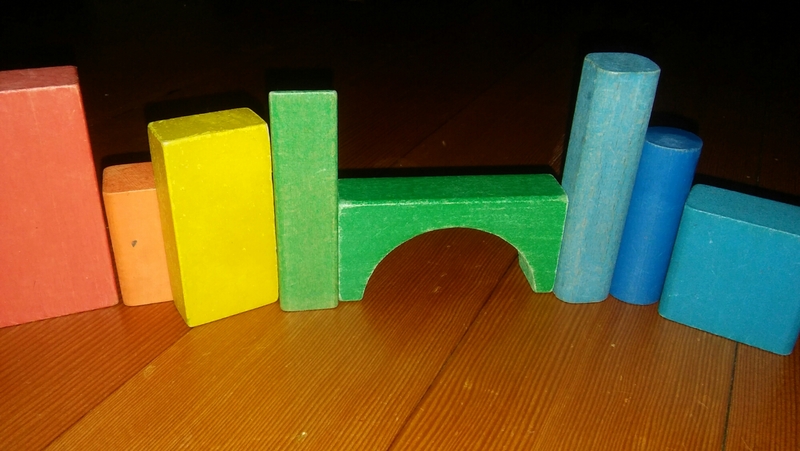 Well today we got a big bag of colorful wooden blocks. And some clothes of course. 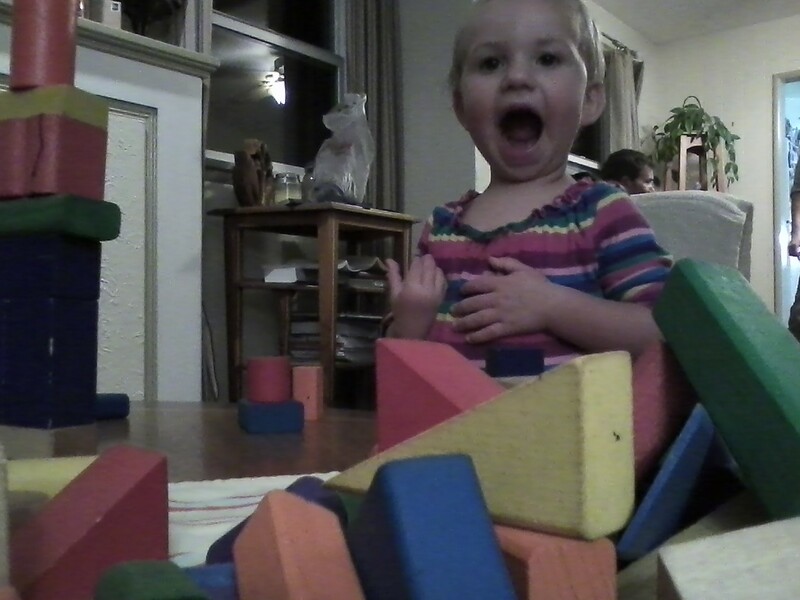 The blocks are best. Before this I only had regular square blocks with numbers and stuff on them. These ones are more interesting to me right now because they are bright colors and all different shapes that do different things when I stack them together. Now we’re going to eat pizza. Are you hungry? Sometimes we have quiet days where we just slow down and have time together. 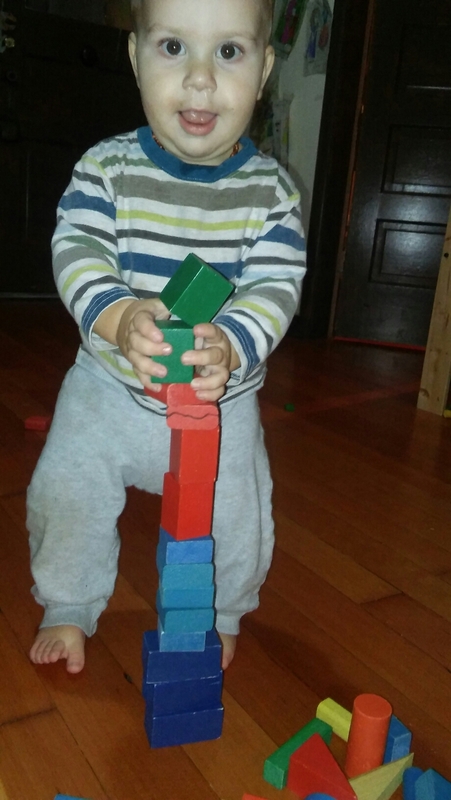 Mama is having me do our schedule with reading time and logic with blocks, shapes, or cones. 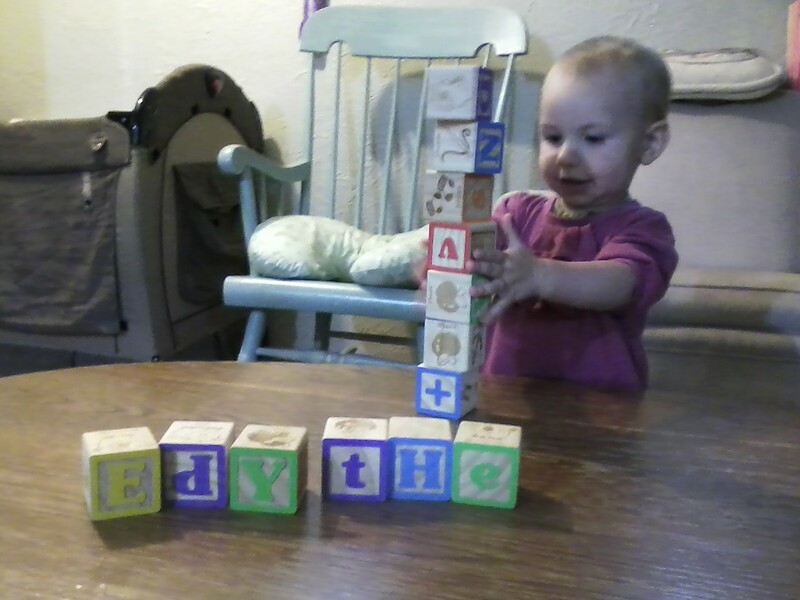 We play together and I knock down all the stuff she makes. 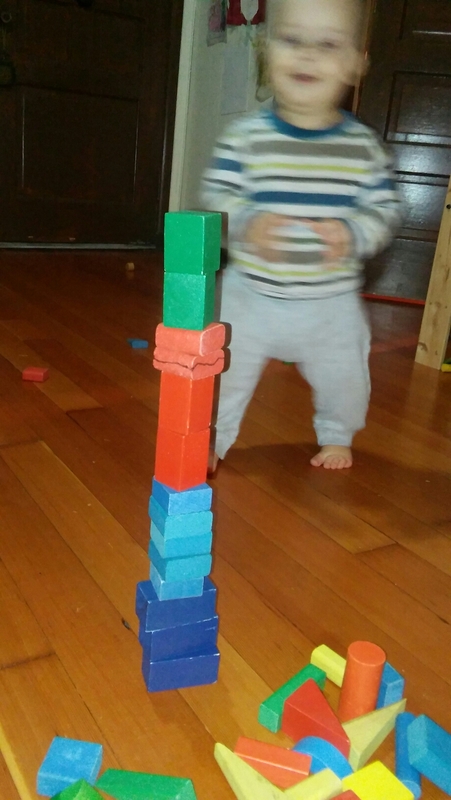 I can make a tower with four blocks if I want but knocking down is more fun. I am also learning to fall asleep all by myself at nap time. It’s stupid. I’m never going to need that skill in the real world. I think it’s just time for Mama to read by herself. She gets all the good books. In between all that I work on all the cool stuff I can do. I can get on and off my rocking horse all by my self even though it’s tall. I can get onto anything actually if I want. I can wear underwear too. I can clean up. And I can copy faces and whistle.